Xavier Torres of Wauseon carries the ball Friday against Delta in the season finale. The senior accounted for three total touchdowns in his final game at Harmon Field. Delta quarterback Dawson Swicegood rolls to his right, looking for a receiver to pass to during Friday’s game at Wauseon. The Panthers fell to the Indians 26-10. 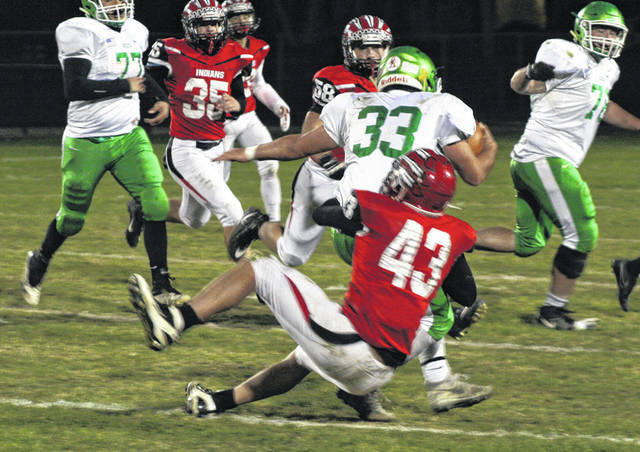 Isaac Wilson of Wauseon (43) brings down Delta running back Tristen Saeger. J.D. 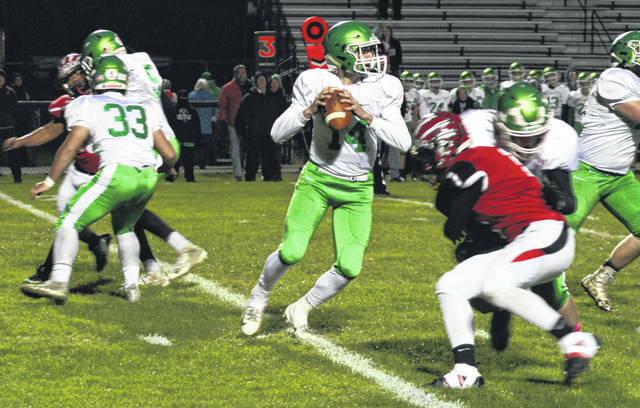 Osborn looks for running room for Delta Friday night. 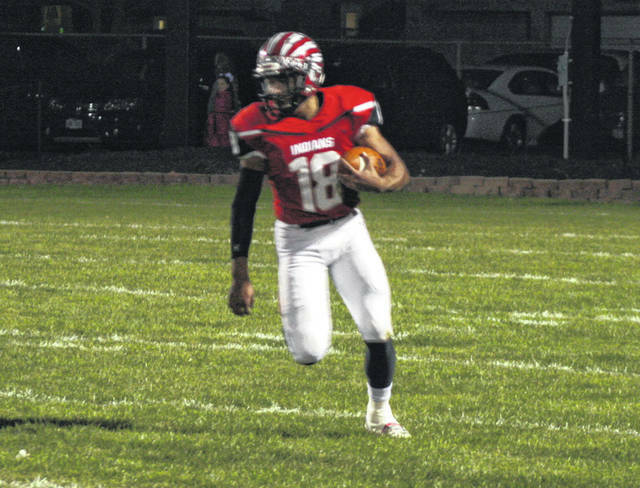 On what was the last game at Harmon Field for the Wauseon seniors, it was fitting that senior Xavier Torres had a big night. Torres was credited with three scores – all coming in the first half – as the Indians got the best of Delta 26-10 Friday in the season finale for both teams. Delta went three-and-out on its first three possessions, and after the third drive, they had a special teams mishap. The Indians got a hand on the punt, where Torres scooped it up and ran it in. Matt Gonzales missed the extra point to keep the score at 6-0 with 3:15 left in the opening quarter. Torres led the way on the Indians’ first drive of the second quarter. He picked up three first downs on the possession, eventually converting a catch and run from 28 yards out and a Gonzales point after increased their lead to 13-0. He continued to show off his receiving skills later in the quarter. On first-and-10 at the Panther 30-yard line, Torres got loose along the sideline and Penrod laid it in there perfectly, putting the Indians up 20-0 with 6:39 left in the first half. Wauseon essentially put the game out of reach with their first possession of the second half. On a second down play, Penrod busted loose on a quarterback keeper to score from 27 yards out. They tried for the two-point conversion but it was unsuccessful, making it 26-0 early in the third quarter. However, the Panthers did outscore the Indians 10-0 from that point on. First, a Tyler McCullough 25-yard field goal cut it to 26-3 at the 3:52 mark of the third. The Panthers would then take advantage of a Wauseon fumble in their own territory in the fourth quarter. Tristen Saeger had runs of 13 and six yards, while J.D. Osborn also had a six-yarder to put them at the Indian six yard line. Osborn punched it in on second-and-goal to reach the final score with 10:15 remaining. Torres had 85 yards on 13 carries and 75 yards receiving on three catches for the Indians. Penrod added 61 yards rushing on seven carries and had a pair of passing touchdowns as well. 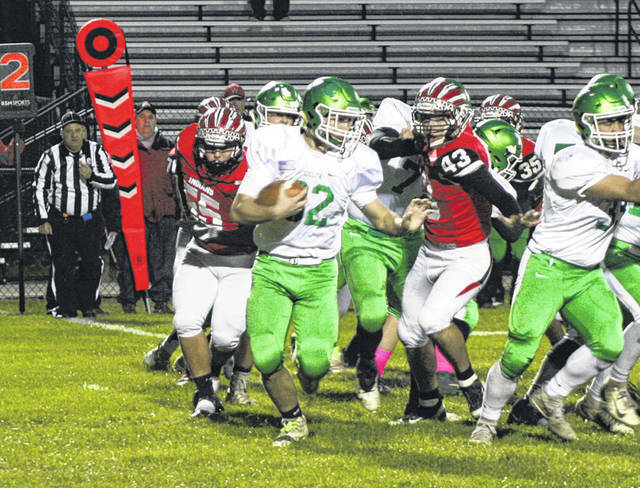 For Delta, Osborn finished with 88 yards on 20 carries and Max Hoffman 64 on 10 carries. Wauseon ended up 4-6 as they won three of their last four.